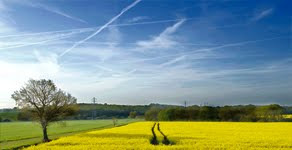 "Hello everyone, Lelainia back with my last project this month ... WOW what a quick week that was! I decided to make a small piece of art". It was my first time working with Grunge Paste and I can honestly say I am now a fan. I LOVE the way it came out looking like a very old piece of stone. I can’t wait to play with it some more! I would highly recommend watching Leandra’s how-to stamp into Grunge Paste. 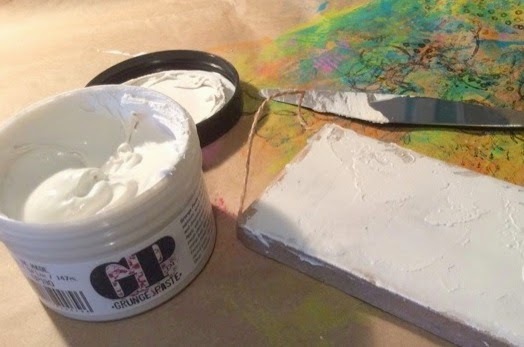 It was super helpful, especially if you’re new to using Grunge Paste like me. 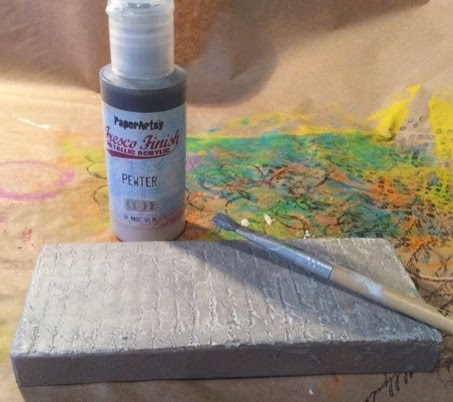 I began by applying a thin layer of Grunge Paste to the Hanging Chunky Board Small, using my pallet knife. 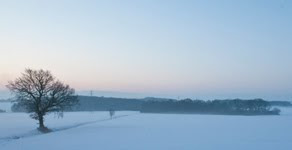 I was careful not to have it covering the sides. When I got any spilling over, I just scraped it away with the palette knife. Next I took the cursive stamp from Eclectica ESN10 and spritzed it lightly with water. I rubbed my fingers over the stamp to help the water work its way down into the grooves of the stamp. 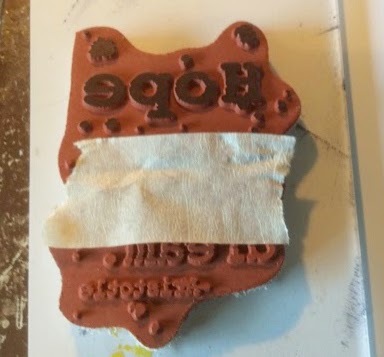 This helps keep the Grunge Paste from sticking to the stamp. I stamped down into the Grunge Paste. It took a couple of impressions to make sure the entire surface had the cursive writing covering it. If you don’t like how it looks, you can always smooth it over with your palette knife and try again. Just make sure you re-wet your stamp before trying again. (I stamped mine twice before I was satisfied.) 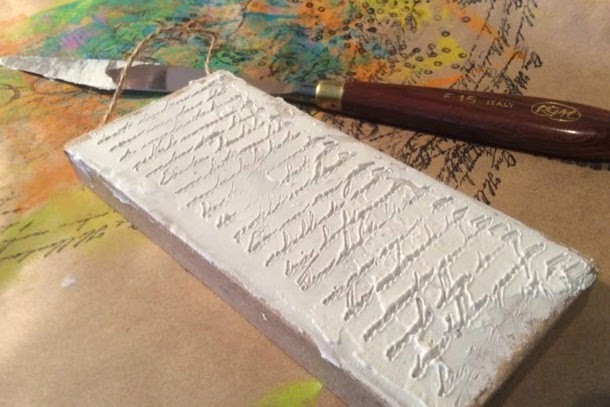 While it was waiting for my chunky board to dry, I washed my stamp to get any remnants of Grunge Paste off before it dried. Once the Grunge Paste was dry, I painted over it with Pewter. I also painted the sides of the chunky board the same colour. 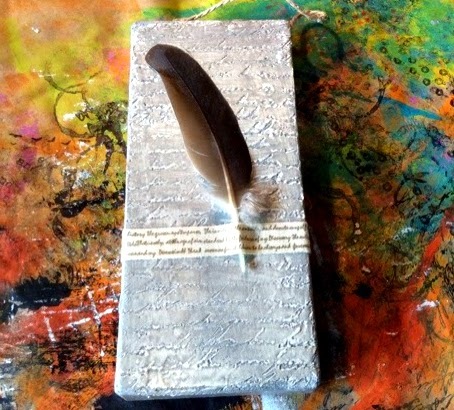 Next I chose a found feather from some I had lying around my studio. I cut a 3 inch length of Prima Trim and applied double sided tape to the back. 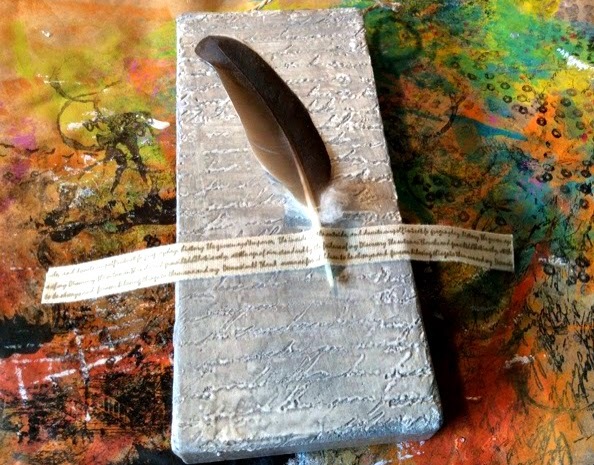 I centred the feather and used the trim to attach it to the chunky board by laying it across stem of the father and wrapping it around the back on both sides. 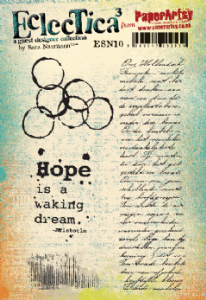 I masked off the “Hope is a waking dream” stamp so that I could single out the word “Hope” and stamped it on a scrap of Smoothy White Stamping Card. I cut the word out as a rectangle and then ever so slightly rounded off the corners with my scissors. I used a charcoal pencil and outlined the edges of the paper, smudging it with my fingers as I went. 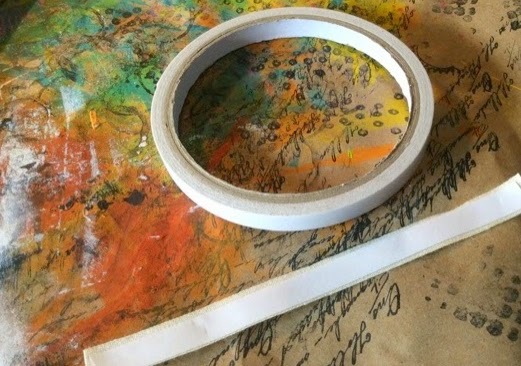 I like to do this to give some definition to the word and also to help the paper blend into the piece better. 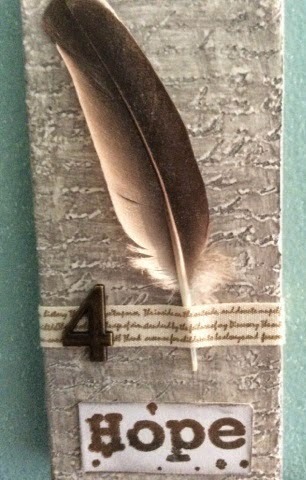 I applied some double sided tape to the back and added it to the chunky board, just below the feather. 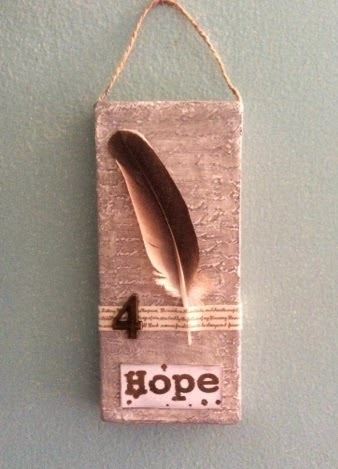 Lastly, I added a metal number “4” from the Prima Vintage Trinkets collection, gluing it to the left of the bottom of the feather, using Aileen’s Tacky Glue. That’s it! 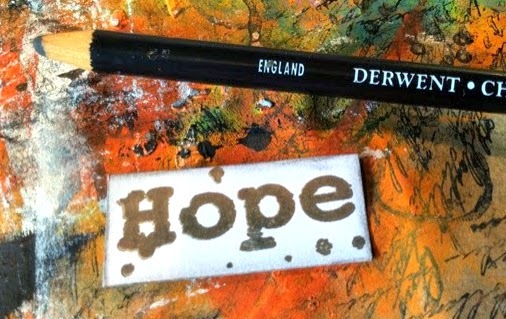 I thought this made a sweet little reminder that there is always hope. I’m going to hang it in my studio. A huge thanks to Lelainia from PaperArtsy HQ for creating this little gem. 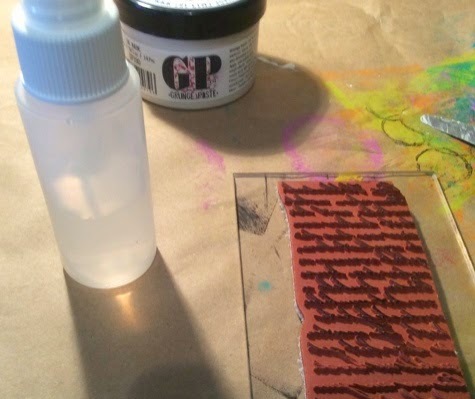 Grunge Paste is such an awesome medium to work with as you have shown here from the detailed image of the stamp. A lovely home decor piece. Thanks Lelainia for sharing your artwork with us once again. Good to have you back. That is beautiful, and I bet now you've found grunge paste you will use it again and again! A perfect example of less is more! I love it. Thanks everyone! Yes, I am thrilled to know about Grunge Paste now. It's such an interesting medium to work with & I love how quickly it dries. That is a little piece of art perfection. Thank you for a great first week Lelainia. And I'm another fan of GP, it's terrific. A great piece of art Lelainia. I love GP too, so versatile and makes such great textures. A fantastic little project Lelainia, I love that textured background! Great piece Lelainia. I especially love the texture/color of the background and the sentiment!